In Amercian Junction malayalam movie directed by Thomas Thoppilkudi started rolling at Ernakulam. The movie which features Tini Tom, Salim Kumar, Sruthi Lakshmi in lead will also have Sivadas Mattannur, Jayaprakash Nedumangad, Kalabhavan Shiju, Biju Kalabhavan and Joby Kalabhavan, Shoba Mohan Sruthi Nair and Kochin Manaf donning prominent roles. The story of the movie zooms into the life of few youngsters who dream to become rich. With movies creamed with humour getting huge response from movie enthusiasts, malayalam film makers are working behind the screen to satisfy the audience. With a long line of malayalam movies getting ready to tickle the funny bones, yet another movie is under shoot with a handful of fresh faces in lead. Other than Tini Tom, Salim Kumar and Sruthi Lakshmi, the movie will also feature Sivadas Mattannur, Jayaprakash Nedumangad, Kalabhavan Shiju, Biju Kalabhavan and Joby Kalabhavan, Shoba Mohan Sruthi Nair and Kochin Manaf. 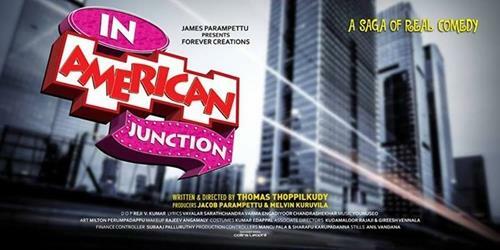 'In Amercian Junction' zooms into the life of few youngsters who dreams to become rich. Antony, Lalu, Joe Kuttan, Ramesan and Nayana are members of a comedy troupe. Being highly talented artists, the youngsters get a chance to show their skill before the malayalees residing in United States. Getting excited to visit America for a stage programme, the four youngsters who come from poor background, knits their dream of becoming wealthy. But their dream to become big shatters as the sponsor of the programme dies as they reach America. But the young hearts were not ready to give up. Without the help of any one, the four decided to conduct a road show to raise money. Creamed with humour and suspense, rest of the story moves to next phase with each frame filled with suspense keeps the audience intact. It would also zoom into the tactics played by the youngsters for their survival. Thomas Thoppilkudi, known for his script works for small screen projects would be taking a step forward donning the role of the director. This movie is being produced by Jacob Parambath and Melwin Kuruvila, under 'For Ever Creations' banner. 'In Amercian Junction' would also be stepping stone for budding talents like Sivadas Mattannur, Biju Kalabhavan and Joby Kalabhavan to show their mettle on big screen who are known for their acting skill on small screen comedy programmes and other stage shows. For the lyrics of Vayalar Sharath and Egadiyoor, the music will be set by Yunis.